Coming off the heels of a recent 1,000 vertical foot expansion, Magic Mountain looked to build a legitimate beginner ski complex. Though not part of the original concept maps, the Hocus Pocus Beginner's Paradise was soon planned. A brand new Hall double chairlift, running 1,140 feet while climbing 180 vertical feet was installed west of the base area (where a small ski school slope was previously located). 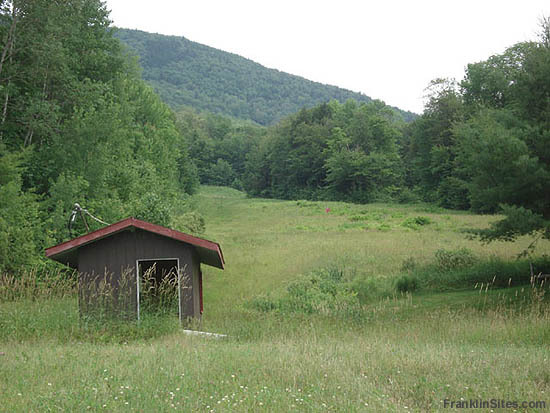 Also known as the "Little Chairlift," it served a slope ("Hocus Pocus") and trail ("Rabbit Run"). The novice area remained in operation until Magic Mountain closed in 1991. A few years later the Little Chairlift was removed and installed at Mt. Tom in Massachusetts. After Mt. Tom closed, Berkshire East purchased the double chairlift and installed it in 2001 (incidentally as the "Little Chair"). 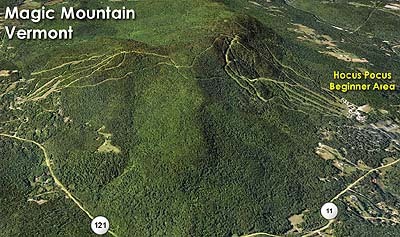 Since reopening in 1997, there have been plans to install a lift on the Hocus Pocus slope (now known as "Little Dipper"), though nothing concrete as been announced. 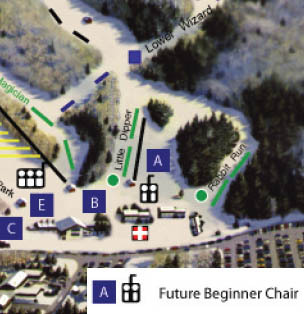 The Little Dipper slope is considered open (albeit without dedicated lift service), however the Rabbit Run trail was removed from the trail map in 2008.